This quote from Isabel Wyatt came to me a few weeks back as young people in Florida were standing up to the powerful, demanding the value of their lives over the profit of an industry. 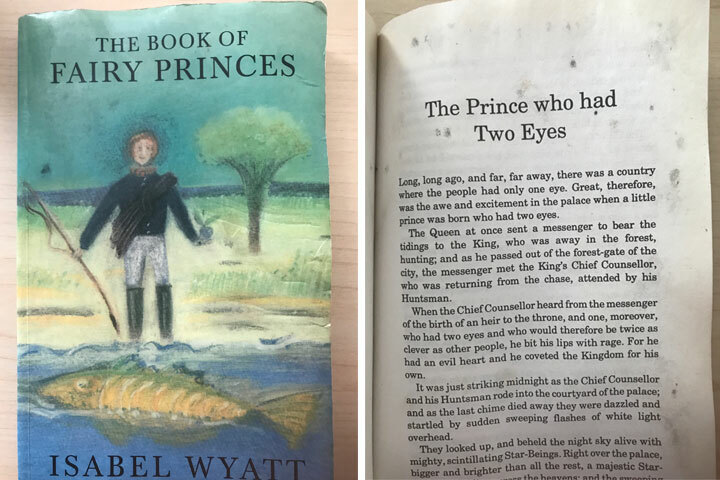 Our battered, mildewed copy of the storybook for middle-grade children, from which the quote comes, carries the older, less inclusive title The Book of Fairy Princes; the newer edition has been retitled as The Kingdom of Beautiful Colors. Title notwithstanding, it is a book filled with considerable wisdom for this blossoming generation. And I think those of us aging into elderhood can find solace and inspiration in her words as we witness these amazing children, teens, and young adults as they rise to meet the challenges of this world. In one of the stories from the book, starry visitors bestow on the infant in “The Prince Who Had Two Eyes” wonderful gifts, but it is two of the final gifts that my mind turns to. One is the Cap of the Dark Star, as an old order will end and a new begin with this two-eyed prince; the other is the Everlasting Rose which blesses the baby with courage and a lion’s heart. After a standard fairy tale plot in which one adult wants him killed, another’s absence makes it possible and a third fosters him, the prince goes on a quest and reaches his destiny. I admit that as I look at my children, who are 18, 16 and 13, I feel hope when I imagine them each wearing their own charmed cap that may help them usher in a new order. Baby boomers and Gen-Xers, the grandparents and parents of the vanguard of this movement, have done their part, for better or worse. I’m relieved that their progeny are already prepared to do their part to bring change. The cynicism my generation was burdened with seems to have transformed for them into a clear-eyed acceptance of where things stand and a belief that they have the power to change it. When these victims of gun violence boldly state their intention to force those too tired to change anything out of power, I suddenly feel a strength of purpose I do not remember myself feeling as I reached voting age. I do not remember believing things could be any different. I remember thinking incremental steps were the only path open to us. I think I lacked their leonine courage. However, I’ve seen signs of it in my house since each of my own children made eye contact, took first steps, or fell off of bicycles. At every stage, we have blown on these embers and tried hard to feed bits of kindling to and to stoke their growing flames. For us, the stories of Isabel Wyatt were part of that effort. They helped us frame discussions about our roles in the world or our impact on the environment. And now, she’s helping me let go as I watch all of these awesome individuals launch into their own starry realms, ready to face the world they are inheriting. I can only hope that we’ve blessed and girded them with a readiness to persevere through all the hardships and dangers in store. Looking further at “The Prince Who Had Two Eyes” and the archetypes in it, we see the evil counselor who wants to kill the baby in the cradle, the absent parent who makes the job easier and the foster family of lions who saves his life and cares for him. We ourselves can inhabit each of the roles of the archetypal adults. Like the counselor, we might fear the power of a new generation, wanting to keep them in line with the values and mores we came up under. Like the parents, we might abandon them to “nurses”, absenting ourselves from the upheaval and messiness of growth. Can we find the strength to instead foster them as the lion family? Can we instead see their celestial splendor trailing them into this world? Can we support them with a lion’s courage, accepting them just as we find them, making space for them to reach their potential? Our children are born with their own starry gifts. They are rising stars with a chance for clear-sightedness. We hope they stand on the shoulders of giants to reach heights we could not. When the time comes, and it may be sooner than we expect, we need to be ready to not only step aside, but to support them in their quests. All of this from a book first published almost 70 years ago. Perhaps Isabel Wyatt acted as a final archetype in this story—the Diviner. Enter your email address and you'll never miss out on a post.